A Signed DVD Copy of Award-Winning Robert Williams Documentary is Among the Cool Rewards for Kickstarter Campaign : COMICS ARE EVERYWHERE! Legendary underground artist Robert Williams signs a DVD copy of his new documentary as a reward for one lucky and generous supporter of Comics Are Everywhere. The 2013 Comic-Con International was a pop-savvy magnet for artists, writers, and pop-culture fans alike. While throngs of people flocked to the massive lines for Hall H to catch a glimpse of their favorite celebrity, many others rushed the Exhibit Hall in search of cool comics and other cool artifacts to add to their collection. Sometimes, however, a great artist can walk among us without being immediately recognized. Such is the case with legendary artist Robert Williams who is a compatriot of Robert Crumb from Zap comix during the 1960s. Like Crumb, Williams’ name is synonymous with underground comix. More recently, he founded Juxtapoz magazine that prides itself on celebrating lowbrow art and culture. Williams’ stunning artwork is closer to surrealism than the once rampant, psychedelic eye candy of ‘60s counter culture. Like the namesake of the publication, his personal art teases the eye with jarring and bizarre juxtapositions ricocheting from the ridiculous to the sublime. Williams’ paintings are often populated with sexually charged figures flirting on hot rods and machines; mayhem and beauty often co-existing in the same compositions. You can find a signed copy of Robert Williams Mr. Bitchin' among the collection of cool rewards on the Kickstarter campaign for Comics Are Everywhere. 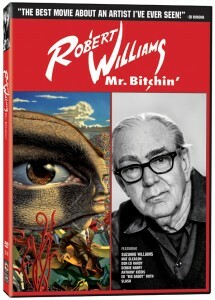 So, it is only natural that Williams would be a fascinating subject for Mary C. Reese’s documentary Robert Williams Mr. Bitchin,’ which won the “Best Documentary” award at this year’s Comic-Con International Independent Film Festival. Williams was kind enough sign one of his DVDs in support of the Kickstarter campaign for Comics Are Everywhere. We are offering the DVD as a reward for one of the larger donations. 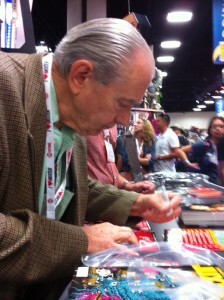 Years ago, I interviewed Williams and his artist wife Suzanne for an article on one of his appearances at Comic-Con. And I am looking forward to doing an on-camera interview with Williams for Comics Are Everywhere in the coming months. Log onto our Kickstarter page to learn more about the cool rewards and please give what you can to help us achieve our goal!